This error message can come up when adding a new charge code or when adding time to a charge code listed on your timesheet that you have already charged time to. This is a common error many timekeeping users receive. To allow them to charge against a certain charge code, you must make sure that they’re set up correctly in the accounting system. 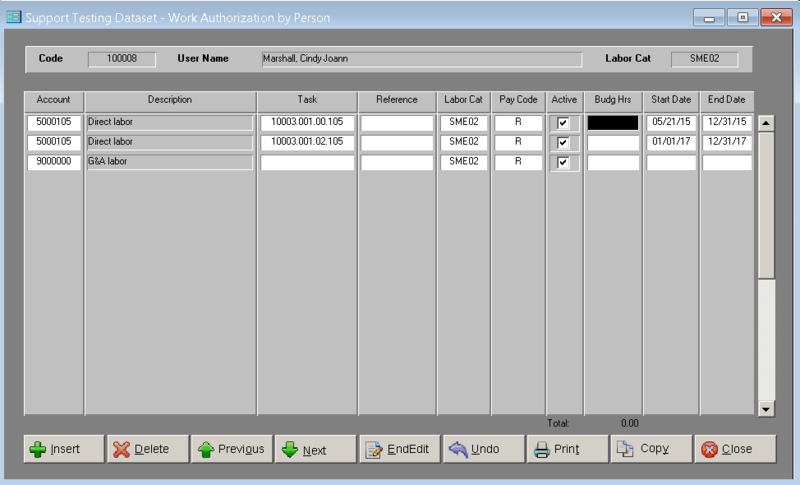 Sometimes charge codes can be deleted, changed, or made inactive during an active timesheet period. An example of this is shown below. It is the end of the day on Friday the 18th, and Cindy, a timekeeping user, must enter her time so she can submit her timesheet. When trying to add two hours to Operations Support OY2, the “You are not authorized to charge” error has appeared. She has come to you confused as to why she is receiving this error when she had entered time to this charge code the previous day. This is because on her work authorization in the accounting system, the Operations Support OY2 line was deleted, modified, or unchecked in the Active column. Someone then imported in timekeeping, which brought this change over. The Operations Support OY2 line is still visible on the timesheet since Cindy had previously charged time to this charge code before the change. You can either hit F5 to search for their employee ID, in this example Cindy’s is 100008, or page down until you get to their work authorization, which should have their employee code and username listed at the top of the screen. Once you get to this screen, you should verify that the charge code is on the work authorization. Since we know they are receiving this error, it most likely is not and will need to be added. You may notice that the line is listed, but the box is just unchecked in the Active column. In this case, all you will need to do is check the box then import. If any part of the charge code is changed, such as the task, labor category, or pay code, the original charge code will no longer exist, causing the timekeeping user to receive the error. 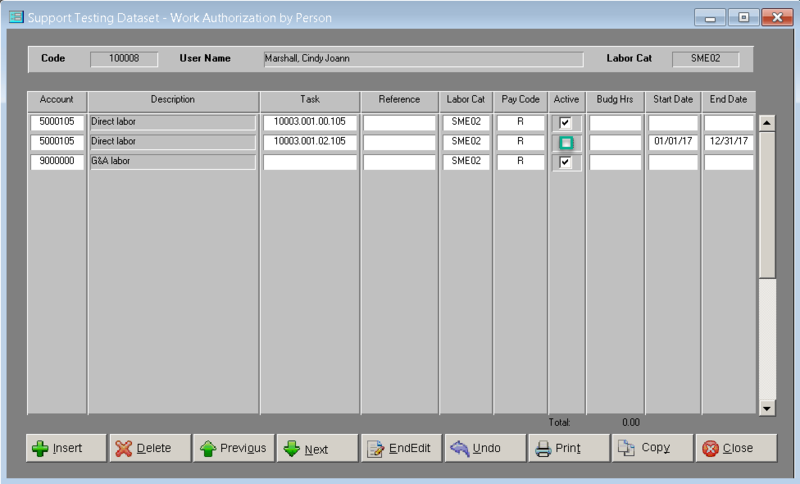 For example, the screen below illustrates Cindy’s work authorization before a change was made (what it should look like). However, the following day, she is trying to enter time on her timesheet against the Operations Support OY2 charge code (associated with task 10003.001.02.105), and she is receiving the error. When looking at her work authorization now, we can see that the pay code has been changed (from “R” to “O”), creating a new charge code, and making the original one nonexistent (as if it was deleted). If this was done accidentally then all you need to do is change the pay code from “O” back to “R”, and then import. If Cindy needed a similar charge code but with a different pay code, a new line should have been inserted to create this new charge code with the different pay code. Once the pay code is changed back to what it should be, or recreated, you may import. 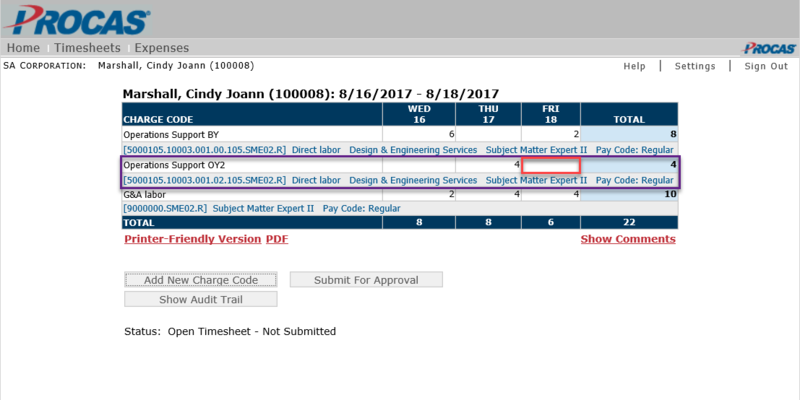 In the picture below we can see that the Operations Support OY2 line does not exist on Cindy’s work authorization, so it will need to be added back in for her. 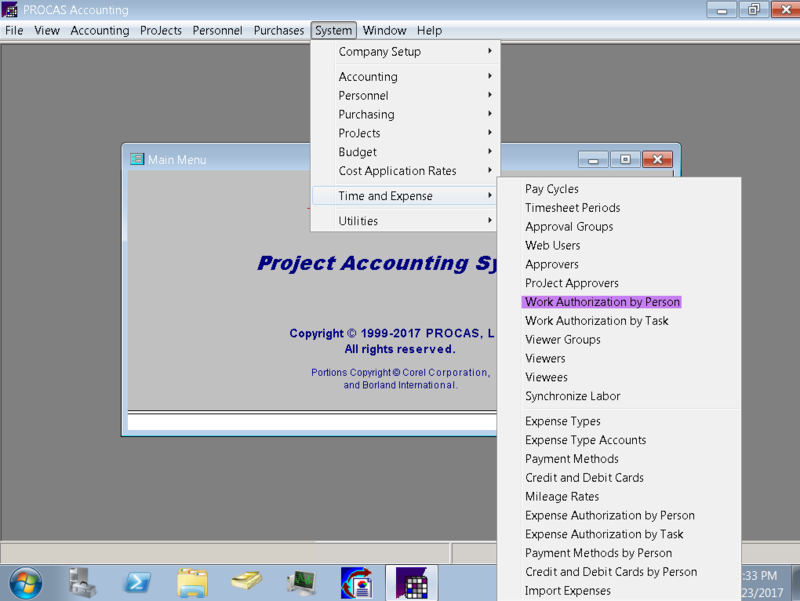 To start, you will hit "Insert” and enter in the correct account, which is highlighted in yellow below (the highlighted fields mean they are required fields). You can hit F6 to see a list of the options you may pick from. 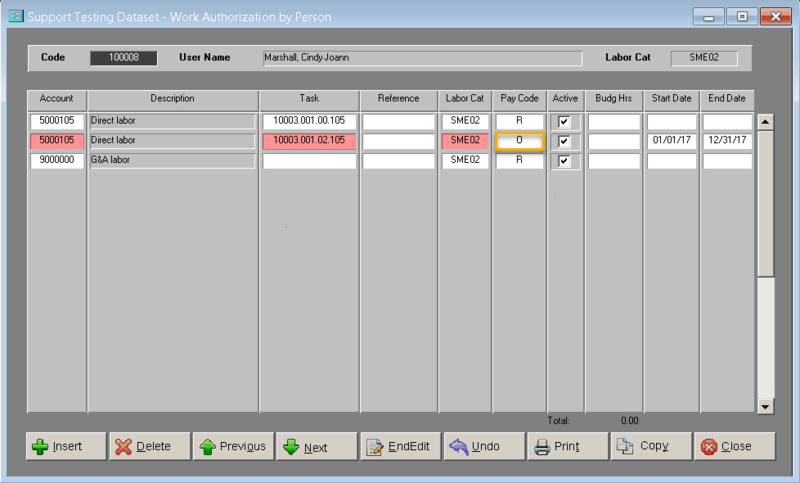 Next, you should verify the task, which is highlighted in pink below, if there is one, as well as the labor category and pay code. It is also very important that the box is checked in the “Active” column because simply leaving this unchecked will make the charge code inactive, which in effect will not let the timekeeping user charge to this code (back to scenario #1). Once the charge code has been re-entered, as you see below, you may import. Once you click “Import” you will see the status of the import above the Import button you just clicked. Once the status says “Import Successful,” the charge code(s) that were added should now be available for Cindy. Although this error may seem difficult, if you follow these steps, the timekeeping user will be authorized to charge again in no time! Just remember, there are three different possible scenarios: (1) either the “Active” box was unchecked for this charge code, (2) a piece of the charge code was changed, or (3) the charge code line was deleted completely. The fix for these are straightforward. Once in work authorization, check to make sure the line exists, and if it does, that the “Active” box is checked. Lastly, verify that all pieces of the charge code are correct because one piece being changed overwrites that original charge code (creating a new one). 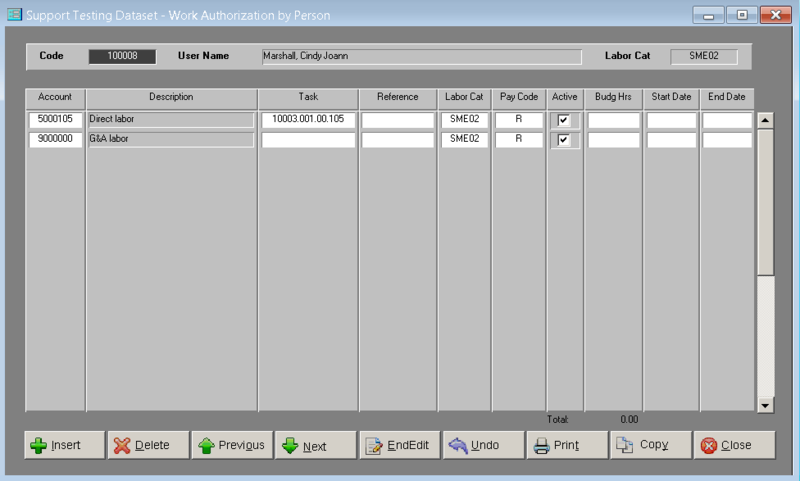 Once everything looks good in the work authorization, you’re ready to import, and the timekeeping user will again be able to charge time to the charge code with no errors.